According to a leaked U.S. plan, Washington and Moscow would merge their respective air campaigns against non-state armed groups in Syria. The United States will propose increasing military cooperation and sharing intelligence with Russia to identify and target Islamic State group and al-Qaida headquarters, training camps and supply routes in Syria, the Washington Post reported. The extent of coordination set out in the document would represent a major shift after years of rivalry between Washington and Moscow. The proposal, set out in a document published by the newspaper, will be presented by Secretary of State John Kerry during a visit to Moscow on Thursday, it said. The report comes after Kerry referred earlier this week to two Islamist rebel groups in Syria, Jaysh al-Islam, Ahrar al-Sham, as “subgroups” of al-Qaida and the Islamic State group, appearing to echo the Russian line and justifying airstrikes on both under the auspices of a joint U.S.-Russian bombing campaign. 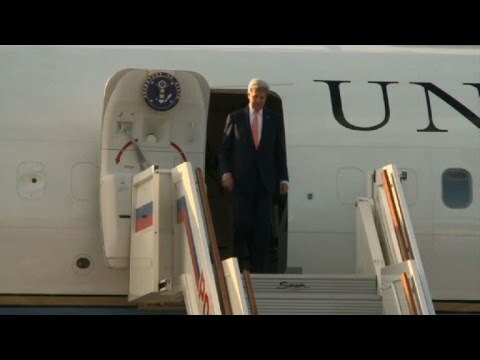 Kerry declined to comment when asked about the report in The Washington Post. “I’ll have comments, going to Moscow, meeting with President Putin tonight; we’ll have plenty of time to talk about it and I’ll give you all a sense of where we are,” he told reporters in Paris. A senior State Department official told Reuters that Kerry would discuss how to deal with Islamic State and al Qaeda in Syria, as well as efforts to reduce the violence, allow humanitarian access and move towards political transition. “At present we are not conducting or coordinating military operations with Russia, nor is it clear we will reach an agreement to do so,” the official said. The document published by The Washington Post called for intelligence sharing to identify leadership targets, training camps, supply lines and headquarters of the Nusra Front, al Qaeda’s affiliate in Syria. Strikes against those targets could be carried out by U.S. or Russian jets. It said that expanded coordination between the United States and Russia would be channeled through a Joint Implementation Group, based in the vicinity of the Jordanian capital Amman.